If seems like we have a preference for California beers, we do. There are lots of reasons for that, mainly we are located in California so they are the most available to us. Also, we have already stated many other reasons that California is the best beer state. So it’s not really a surprise that Ballast Point is making the blog headlines. The only surprise is why Beer Soaked Scott hasn’t already posted his review. After all, this is one of his favorite brews. Then again, I’ve learned that it’s not always best to ask why Scott hasn’t done something. Ever heard the saying “Don’t poke an angry bear”? 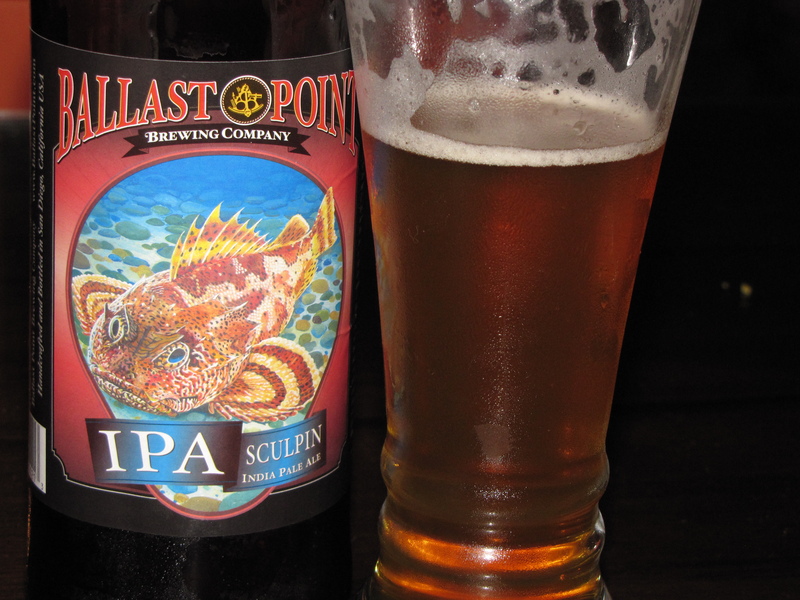 Sculpin IPA – People simply cannot get enough of Sculpin – a deceptively light bodied, yet very hoppy IPA that is brimming with bright apricot, peach, mango, and lemon flavors which are imparted by the skillful use of a variety of hops. Sculpin is a testament to our humble beginnings as Home Brew Mart, where we began our commitment to making unique yet highly drinkable beer. We literally struck gold (as in medal) on this particular experiment – at the World Beer Cup 2010 in the International Pale Ale category. Despite its poisonous spikes, the meat from a Sculpin is considered some of the tastiest. And that’s what makes Sculpin the perfect name for this IPA: Has a sting, but tastes great – now that’s a Ballast Point India Pale Ale. It pours a nice dark golden color with a healthy head. In the photo I’ve already taken a huge gulp, so it’s missing some of it’s glory. But seriously, I dare you to try to pour this without immediately taking a sip. Yeah, it’s that good. This is very typical of the west coast IPA style of craft beer that we know and love because it has that big hop character, a piney and citrusy nose, and a clean crisp bite to it. All the notes mentioned on the bottle are there, especially the apricot flavors. This one is an all-time beer soaked favorite and has a permanent spot reserved in the man fridge. For me it’s a 5 cap beer for sure. One that will always be welcomed with open arms and a clean glass. And for the record it holds its own alongside spicy food too. 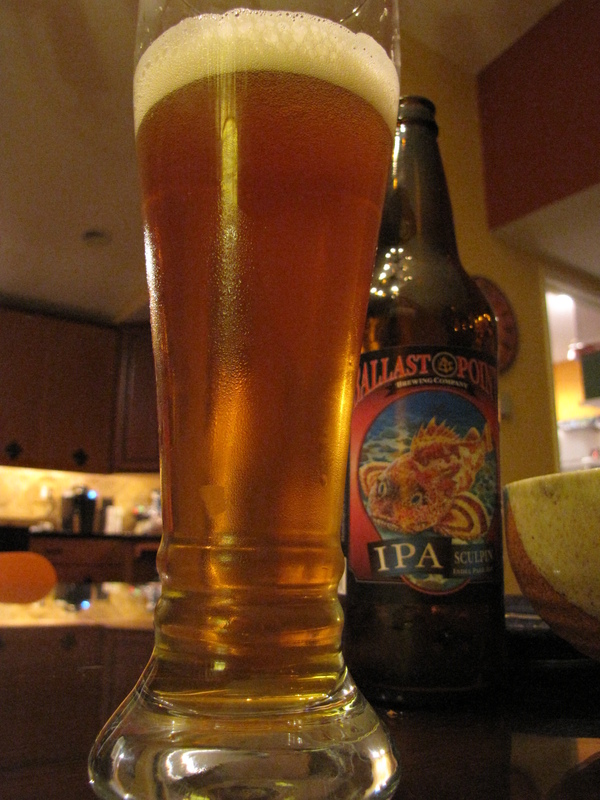 This entry was posted in Craft Brew, IPA, Review and tagged 5 caps, 7%, Ballast Point, India Pale Ale, IPA, Sculpin by Erik. Bookmark the permalink. Oh, almost forgot…Top Fiver for me; LOVE this beer. Enjoying a Sculpin at work on a Friday afternoon. Happy American Craft Beer Week!